NORWALK, Conn. – Point by point, representatives of a developer looking to build on the controversial White Barn property rebutted arguments Wednesday made by opponents in an effort to persuade the Zoning Commission to greenlight the plan. The Commission sent the proposal to build a 15-home conservation development at 440 Newtown Ave. back to committee for review after Attorney Liz Suchy led nearly two hours of assault on the assertions made last week by neighbors of the property on the Cranbury/Westport line, members of the Norwalk Land Trust and Save Cranbury and their lawyers. Much of the rebuttal focused on the opposition’s claims about the power lines running through the property. Although Attorney Keith Ainsworth said last week that the power lines were not included on the applicant’s plans, “Frankly that is just incorrect,” Suchy said. Ainsworth had attacked a letter in the application as “hearsay,” as it claimed Eversource was OK with the development going under its power lines. “You can consider hearsay testimony because you are an administrative agency,” Suchy said. 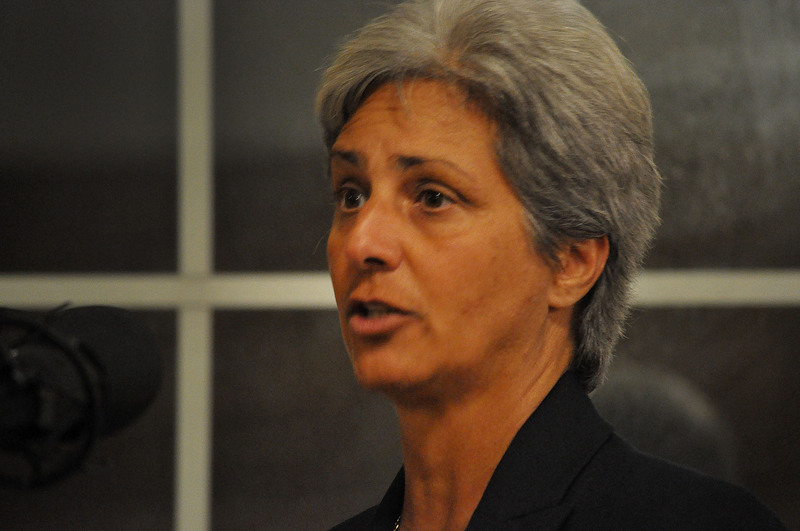 The Commission in 2009 approved a conservation area in Silvermine that contains a 20-foot wide easement for underground water main running through the conservation area, Aceto said, part of her argument that precedents exist. “Eversource has in excess of 2,300 miles of transmission lines that criss-cross this state covering suburban and urban areas,” Aceto said, asserting that it is not unusual for development under power lines. Last week, opponents argued that Eversource would need to visit the property to maintain the area under the power lines. Trees are trimmed every six years, they said. The fears are unsubstantiated and unwarranted, Aceto said, as there are only three poles involved. “It’s an overhead line so once the enhancements are done on the ground there is no reason for vegetative cover to be disrupted. It’s an overhead line so there won’t be disruption on the ground,” Aceto said. “My client has been involved in this property for about 10 years. Since that time we are not aware of them coming out there,” Aceto said. Opponents, sitting in the audience, laughed. A statement released by Celia Maddox of Save Cranbury after the meeting explained the laughter. “Eversource can and does already enter on a regular basis to cut or remove trees. Our members have seen them,” Maddox wrote. Landscape Architect Kate Throckmorton provided the Commission with copies of six magazine articles to support the idea that conservation areas and power lines can co-exist. “I think that kind of highlights repeatedly that utility easements and electrical power line ways in conservation easements do exist, they cohabitate well together, they have worked together and the power company has worked with land trusts through the state,” Throckmorton said. Attorney Liz Suchy talks to the Norwalk Zoning Commission on Wednesday in the City Hall community room. Suchy said several times that developer Jim Fieber did not agree with the opinion issued early this year by Assistant Corporation Counsel Brian McCann, asserting that the White Barn Preserve could not be used as part of the density calculation for the property, but chose not to challenge it legally, instead reducing the number of homes from 20 to 15. Fieber had not waived his rights, Suchy said. “I submit to you that this is certainly more harmonious than any of the other uses that might (have been submitted),” Suchy said. Opponents said that the conservation land proposed had been gerrymandered; Suchy said regulations do not specify the size or shape of conservation area. “We have to abide by the regulations as they exist and we have done that,” Suchy said. The Plan Review Committee will again consider the proposal at its next scheduled meeting, Sept. 10. Last night’s presentation by Attorney Suchy contained numerous incorrect statements. While I admire her zeal in advocating for her client, I feel it is important to set the record straight. Attorney Ainsworth did not say that the power lines were not included on the applicant’s plans. In fact during Atty. Ainsworth’s presentation he acknowledged that the sub-transmission system crossing the White Barn Property is represented by a thin dotted line on the applicant’s plan. The thin dotted line is in reality six wires carrying 27,600 volts to substations feeding 5,000-10,000 households. What Attorney Ainsworth said was that the EASEMENT is not noted on the plan, which is accurate. Moreover, Mr. Ainsworth was correct when he noted that there was no mention of the easement in the applicant’s presentation to the Zoning Commission. Yet there is video evidence that they were aware of it more than a month prior. Via the easement, Eversource owns the right to “trim, cut, take down and remove at any and all times such trees, parts of trees, limbs, branches, underbrush and structures, as in the judgement of the grantee may interfere with or endanger said electric lines or its operation.” Eversource also owns the right to upgrade the line. There is no limit on Eversource’s ability to increase the area they clear. The so-called “meadow” proposed for underneath the lines could be removed and replaced by gravel if Eversource deems it necessary at any time in the future. Eversource owns these rights. They bought them in 1932 from property owner Helen Cook. They owned these rights before most of us were born, and they’ll continue to own them long after we’re gone. Developer James Fieber is likely unaware of Eversource entering the White Barn property because he doesn’t live there. Save Cranbury members who abut the property have observed that Eversource regularly trims or removes trees on the proposed “conservation land”. Ms. Aceto’s statements require careful examination. The letter she submitted to the Zoning file states that she spoke with Eversource and promised that the developer would respect all of Eversource’s existing rights. According to Ms. Aceto, Eversource replied that as long as Eversource’s rights are respected, whatever the developer does is fine. Respecting Eversource’s rights means we may call it conservation land as long as we allow Eversource to enter and perform activities that are decidedly NOT conservation. If approved, this would be the only conservation land I’m aware of where a utility company owns the right to regularly enter, remove trees, apply poison to keep the trees from re-growing, upgrade the lines, replace the grass with gravel, and expand the area they clear whenever they like. Make-believe conservation land does not merit a special permit to build high-density housing in the heart of Cranbury, less than 30 feet from the White Barn Preserve. And, of course, Eversource (a.k.a. CL&P) will pick up close to two dozen new clients when the builder from NEW CANAAN gets his approval from our CONSERVATION (?) commission. Eversource is the successor to CL&P and will do whatever works best for their bottom line on that right of way. Anybody that suggests anything else is naive about how power companies work. It may well be maintained as a meadow, but that is just one option available to Eversource. There are others and their bottom line will govern which is chosen. Getting in there with tree trimming equipment is probably more expensive than applying chemicals to prevent tree growth right now, but who knows what restrictions on the use of such chemicals may be enacted ? Chemicals covered with small stone may, over the long haul, be the least expensive option at some point. Citing a precedent in Silvermine where a utility right of way was accepted as part of conservation land, when that right of way was for an underground water main, normally not maintained by the water company, may be legally appropriate, but is almost apples to oranges comparison. I don’t know the history of the site, but as former member of the ZBA, I am curious about how the opponents of the project (which I agree is a disaster) answer with regard to the regulations and case law? If the Planning Commission decides they don’t like the plan, they need some legal foundation for their objection or it will be successfully challenged in court. This is a good thing. It was the lawsuit by Walter Briggs against Frank Sinatra in Rowayton that ultimately brought down the illegal activities of the ZBA and turned it into what it is today, a model of jurisprudence. They used to stay up until 1 AM desperately trying to find a way to satisfy the developer. Now they not infrequently cancel meetings for want of applicants. So once you abandon the case law, state statutes and local regulations for a “good” cause, you open the door wide for the misuse of the Commission’s powers for evil. The issue about cutting trees seems to me misunderstood. Brushy areas and meadows are valuable habitats and in short supply, as noted at the meeting. Most of the woodland I have seen in southern Fairfield County is junk regrowth on farms that were abandoned during the middle 20th Century. They in no way resemble the original woodland cut in the 17th and 18th Century for farmland. Furthermore, woodland in patches is far less valuable as habitat that large contiguous areas, because to avoid parasitism by cowbirds, nests have to be at least a mile away from disturbed areas. Meadows and brushland need to be maintained, or they will grow up in more junk woods and invasive species. Granted Eversource has huge clout and a corporate devotion to the bottom line, it seems to me that the company would welcome a maintenance program operated by the landowners that simultaneously protected the power lines and enhanced the biodiversity of the land, because it could provide very useful public relations. Such a maintenance program should be a minimum requirement for project approval. The landowners should likewise be responsible for suppressing and removing invasive species such as garlic mustard, bittersweet, Japanese honeysuckle, and phragmites. There should also be requirements that homeowners not plant invasive shrubs such as burning bush and barberry, which spread to adjoining conservation areas. The proper way to develop this land is not to develop it at all, and to maintain it as varied habitat relatively free from invasives. This requires money, organization and most important, buy-in by the citizenry. After living half my life in Massachusetts, I find that the Gold Coast is by comparison much more oriented toward property rights and much less toward public amenities. You don’t have to go far in Boston to find excellent parks and conservation land. Around Norwalk, they are small patches, hard to find, often private, and like Mianus Park in Stamford, often completely overrun with invasives. It is sad that the White Barn will not be preserved for its history if not for its architectural merit. As Tod Bryant noted to me, Liz Suchy was completely silent on the issue, although she rebutted every other objection. Preserving a historic property in the middle of well-managed conservation land is the right thing to do. Tell that to a citizenry whose main concern is lowering property taxes. How ironic that Ms. Suchy brought up Harbor Bluff last night as her great example of drainage and conservation land, etc. I happen to be the primary neighbor abutting the Harbor Bluff development, in Rowayton that was also GERRYMANDERED for conservation easement in 2005. I fought for less density, I lost. There are now 12 cluster homes in the development, 7 of which, line the north and east sides of my property. Before development began – the New Canaan developer tied ribbons around all the trees that he assured me would be ‘saved’ in the conservation land and that would separate our properties. In the end..well you know…this came up and that came up and the drainage ditch needed to be moved for this and that and in the end, every tree that he claimed would be saved was chopped down. And now there is just a grassy knoll where the drainage ditch ultimately went. Later on, two 30-40 foot mature trees that had been included in the ‘conservation land’ on the north side (really just off the patios of the houses) had to be chopped down because they were slowing dying because their root systems had been compromised by the foundations that had been laid for the homes and were in jeopardy of falling on everyone’s homes, depending on which way the hurricane or tropical storm winds blew. One of those trees is still in jeopardy. I wonder who is responsible – Harbor Bluff or the city? New development plans change once the backhoe comes in and starts digging. I encourage P&Z to be very diligent in the mathematical gerrymandering of conservation easements. You all might want to come and see what P&Z approved as conservation land back in 2005. Bottom line, Norwalk’s zoning regulations have loopholes that create unintended consequences when argued by skilled law fiirms. We need zoning reform and until our Common Council people understand that – nothing will change. Perhaps we can vote for it in November, since we have no voice on the P&Z Commission. I agree with Bob Welsh’s comment above, and also listened to a long list of misleading statements from Attorney Suchy last night and her witnesses, which is very troubling for everyone in Norwalk, not just the concerned neighbors. Here’s the issue in a nutshell: There is no restriction known to the applicant or the city at this point on the width of the Eversource utility easement, which can easily be expanded in the future depending on the need for expanding the power grid in our area which is ongoing, as evidenced by the huge expansion along Route 7 a decade ago where the cleared easement is now 150 feet. This means that the city Zoning Commission will be opening up the city taxpayers to future liability if they approve a project with unknown impacts in the future, which could put houses they approve closer or even under an expanded utility corridor, and next to an approved conservation easement that the city or future homeowners have absolutely no control on what Eversource can do with it. None. There are no protections at all that re guaranteed, and Liz Suchy knows that, yet she has intentionally and wrongly portrayed the utility easement as a benign static entity that will need minimum intrusion, a mere guess on her part. She’ll get paid her legal fees and have moved on long before any repercussions of her deception will be known. The record clearly shows that no one knows what the width of the utility easement is, including the applicant, as it is based on the “need” of the utility company in the language and not any dimensions. This is a serious red flag. The record also clearly shows that the applicant made misleading statements about the need to enter and maintain the utility corridor. Meadows do not stay meadows for long in the northeast, in fact, they want to become forests as quickly as possible in a process called “natural succession”, where shrubs and tree seedlings move in and quickly become large trees and eventually a mature forest. This is on the record from the public hearing, and a well-known fact. Meadows, especially surrounded by the major and constant seed source of thousands of surrounding trees, need constant maintenance including major trimming and herbicides, which is also on the record and in Eversource’s own documents. This is very troubling for the future, as any future homeowner (or other entities including the Land Trust) who are likely to be negatively impacted by future work in the utility easement will simply go back to the record and see that the application was approved (if it is) with all of the potential impacts of utility work in an “unspecified area” of the conservation easement just simply ignored by the Zoning Commission, Conservation Commission, P and Z staff, and attorney Liz Suchy. This is irresponsible, and opens up all Norwalk taxpayers to future lawsuits and liability. I also found it troubling that attorney Suchy compared the Conservation Easement approved on Silvermine Ave in 2010 (which was never built by the way although she failed to mention that, as it reverted to conventional zoning), which included a 20-foot wide utility easement for an underground water line, to the high tension power lines on the White Barn property that require constant clearing of an area at least 80 feet width based on existing conditions, and that is subject to weather and natural forces in contrast to an underground water line that is maintenance free. A water line can be expected to last many decades before replacement (some water lines in Norwalk are over a century old). It is in fact a very deceptive comparison to make. Trees do not need trimming an herbicides do not need to be sprayed around modern underground water lines. Finally, attorney Suchy gave wrong legal advice to the Zoning Commission, by suggesting that there is no architectural review in Norwalk, when she referenced my description at the public hearing last week of these houses as ugly “snout houses”. Snout houses are ugly suburban houses with mostly all garage up front with a front door and windows as mere second thoughts squeezed in on the side. This project will appear as a mini storage unit project for people, with nothing but a bunch of oversize garage doors lined up down the street, with dormers stuck on top to give it that “new England” feel as the architect described. Hogwash. The houses are hideous and resemble a “New England” village about as much as Las Vegas resembles Paris. The Zoning Commission absolutely does retains architectural review in the Special Permit regulation, which is what the White Barn application is. The fact that staff and the attorneys for applicants sometimes like to pretend it doesn’t, just reveals the dumbed-down process we have in place. Here’s the facts: the Special Permit conditions that any application needs to be determined to be “in harmony” with for approval, include C.1.a, “density of use and bulk of buildings”, C.1.h “impact on neighborhood properties…”, C.1.i, “existing land use in the area”, C.1.l: conservation of wetlands, watercourses, and other ecologically valuable lands., and C.1.k, “compliance with the Zoning Code and Plan of Development (meaning Master Plan of Conservation and Development).” On that last item, the project needs to follow our Master Plan, which includes directives to “preserve and enhance the character of Norwalk” and “protect neighborhoods from incompatible development”. Building a dense development of a bunch of closely spaced snout houses lined up in a row defies those directives, and the Zoning Commission had every right to question the architecture and layout of this development under the Special Permit regulation. Attorney Suchy’s misleading statements to the Zoning Commission about architectural review is even more troubling knowing the fact that she herself has helped carry “material boards” including brick, shingles, and window frames into Zoning meetings, for the intent to discuss “architectural review” with the Zoning Commission. She has also witnessed countless discussions by the Commission on everything from height to shape to entry layout to freight entrances in addition to the “look” of buildings on many applications. That is “architectural review” even if that phrase is not used on our regulations. It is certainly implied and expected and she knows it, but it didn’t stop her from trying to mislead the Zoning Commission last night. I hope the Zoning Commission understands that Attorney Suchy will say anything apparently, including mis-representing our own regulations and traditions, to persuade them to ignore the record, which includes a public hearing where dozens of witnesses including many lawyers and expert spoke in opposition to the project and no one spoke for it except the applicant and their paid witnesses, and of course their well-paid lawyer Liz Suchy. Ahhhh. Wouldn’t we all love no development at all and force the landowners to build forests and fields and never build on anyone’s property. Wouldn’t it be wonderful if we turned all property into bicycle trails and parks. Then again, who would pay taxes? M. Murray, your sarcasm is expected, especially your personal jibe at me with the bike lane comment (I’m used to it, and Attorney Suchy even felt a need to poke fun at me last night as well, as if safe bike trails and bike lanes to improve quality of life and public safety are a big joke or something. Funny, isn’t it?). Just another sign of our dumbed-down lack of real planning in Norwalk. Liz Suchy also argued with me 2 years ago when I was on Zoning that no one would walk a few blocks to a train station from a new development off of Glover Ave., in order to save her client a few thousand dollars to install a new sidewalk connection. Thats right, she said the residents would get in their cars and drive 2 minutes to park at the bottom of the hill at the train station, and not walk. Why do we need a sidewalk in front of an apartment complex with hundreds of residents right near a train station, she argued. I wish I was joking. She could care less about future impacts of her clients projects to Norwalk, trust me. Her goal is simply to make as much money for herself and her clients, period. Nothing wrong with that, as long as the Zoning Commission realizes where she is coming from and analyzes her statements with the appropriate scrutiny they deserve. Personally I have never been anti-development and had voted for many new projects to expand the tax base when I was on Zoning. I am however strongly against irresponsible development, that can harm the environment and potentially open up the city to future lawsuits that might cost all of us taxpayers dearly. I doubt very much that you would take responsibility for any future costs entailed by the city when potential future homeowners suddenly find themselves living next to a so-called “conservation easement” that our commissions approved that has suddenly become, one day when they wake up, nothing more than a denuded and muddy construction site full of downed trees and trucks installing new poles and lines, right over a wetlands as well, that a fee-hungry lawyer and her profit-hungry developer client downplayed on the record to get approval for. That potential nightmare will cost all of us taxpayers, when a judge looks at the record and sees that our commissions and staff ignored obvious red flags by approving a conservation easement with a utility easement included that is unknown in size by everyone including the developer and his lawyer, and with a completely unpredictable future that could greatly impact future homeowners. It is what I call very bad planning, and in the end bad planning costs all of us no matter where we live in Norwalk, except some developers and lawyers laughing all the way to the bank of course. How is it possible this project has gotten this far? Potential misleading statements by a paid attorney for a developer, are the members of the zoning commission going along with this? Is this why Ms. King’s appointment was delayed by Republicans, so she couldn’t oppose this nonsense? Why are the zoning commissioners letting misleading information slide by? Are they just not knowledgeable enough to contradict the misleading statements? We residents are in trouble!! Thank you NoN, Gordon, Bob and Mike for keeping us informed. We sure didn’t see this much information in the local paper! Mike as usual makes a lot of good points, but I still don’t know what “Plan B” is. What are opponents suggesting, conventional lots? I simply don’t know and would like to find out. If the goal is to prevent the developer from building anything (which as I have noted is the right solution), they had better have solid precedents and statutes to support their contention. As I see it, if you follow the rules, the environment gets screwed. If you don’t, everyone gets screwed. The same thing is true for snout houses. They are an abomination – you can see one as you exit the City Hall parking lot onto Sunset. Snout houses are built into the zoning ordinance because you can’t park in the front setback. But just try to change the zoning to allow parking in front yards and stand back. As I noted, if the community is not in support of progressive development, you will have to maintain a complex set of rules that any creative developer can get around. Mr. Murray perfectly captures the tone of the majority: property rights reign. I am confused by Mike Mushak’s concerns about maintaining the area under the power lines. I think we agree that to keep an area in meadow shrubs you need annual maintenance to cut trees and invasives. Is the concern that Eversource does this crudely? If so, isn’t the solution to do it carefully? If so, can’t that be a condition of approval? Not sure how many of “hundreds” in a development commute by train. I’m sure that most of the residents who are adults would take cars to work, and the number who would take a train in the first place would be minimal. Those who would walk to the train probably will do so anyway. So the study that would need to be done to determine the number is how many people who do not currently take the train would do so if their would be a sidewalk. Same for bike lanes. Are we creating bike lanes for a few hundred bikers in a city of 75,000. Maybe we should compare the number of bicyclists to the number of motorcyclists. Then reserve those lanes for those with the higher number. Lisa, great comment! I wonder, was Liz Suchy also the lawyer for Harbor Bluff that she promoted as a great example of a conservation development, when the reality was they destroyed the conservation easement by killing all the trees and now it’s just lawn? Only in Norwalk. It’s long past time for P and Z reform. Have we done an assessment on Harbor Bluff to determine how much the tax base has increased or decreased on that property since it was built? Norwalk missed the boat many many years ago. Look at our neighbours in Darien, New Caanan, Wilton, and Westport. Norwalk grabbed the money for all those subsidized housing complexes and now we are paying the price. The goal should be to change lower income properties into high income, low tax burden properties. Stamford lowered their burden 20-25 years ago and is now thriving. Our focus on meeting low/affordable income housing should be on the elderly, who are less of a drain on the tax base. Mr Tully: Putting maintenance of the power company easement as a condition on approval of a project this developer has proposed would certainly not bind the power company, with their senior approval, and I doubt if the developer could possibly be bound to do anything to maintain the power company property once the project is approved and his interest in it sold to 15 different people.